Finland-based Jongla ties exclusive partnership with XL Axiata (XL) as its attempt of entering Indonesian market. By doing so, Jongla expects to be able to call its app as one of the top three messenger service in Indonesia by 2015, getting into a direct yet strict competition with the country’s current best three: BlackBerry Messenger, WhatsApp, and Line. The exclusive collaboration will last for a year. XL will promote two special offerings for Jongla users. The first would be the presentation of three special data packages for accessing Jongla, i.e daily (Rp 1000), weekly (Rp 5000), and monthly (Rp 20 thousand), with the minimum quota of 50 MB per day each. The second is the carrier billing capability for in-app purchases, which is, unfortunately, only available for Android users at the moment. This feature lets Jongla users to purchase sticker sets using their cellphone credit. Jongla is compatible with numerous operating systems, including iOS, Android, Windows Phone, and Firefox OS. Since security is the platform’s main concern, it installs the TLS encryption which is claimed to be on same level as banking system security. While in general it provides quite similar features as other messengers, its interactive sticker sets seem to be Jongla’s spearhead to penetrate the market. A few days ago, Jongla had just sealed a € 3,4 million from a number of Finnish investors. The funding is then allocated to expand its business to the promising Asian market. Despite the fact that it has been established since two years ago, Jongla is considerably a stranger to Indonesian users. While it refused to disclose its total number of active users, Jongla claimed that 60% of the users are based in Asia, with Thailand has most of them. Interestingly, Jongla’s Director Business Development, Henry Pohan Simangunsong, is an Indonesian. Furthermore, Jongla decides to use the in-app purchase scheme, which it claims to be appropriate with Asian culture, as its business model. Jongla seems likely to follow Line’s step in expanding the production of its stickers, including by partnering with local designers. 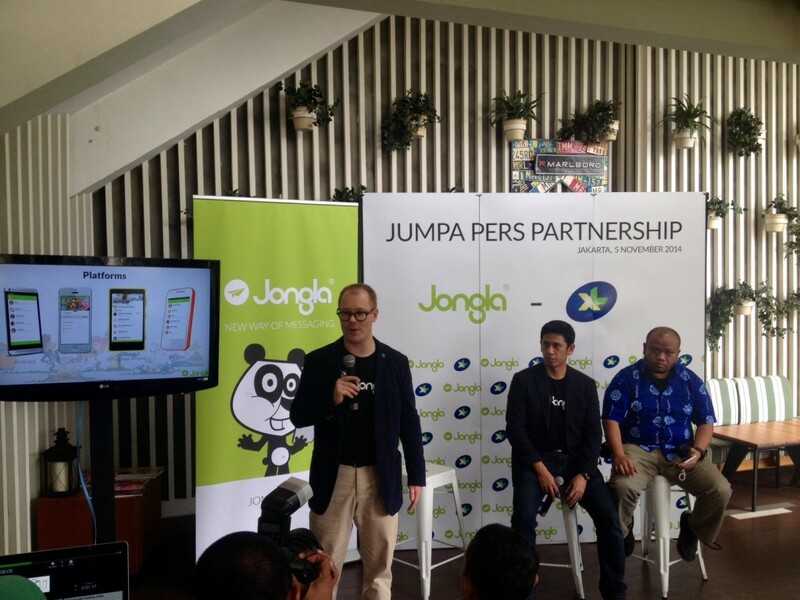 Due to the partnership, Jongla plans to open an office in Jakarta. Currently, the platform has already had an office in Singapore which manages its business in APAC.